Scary Screaming Souls Staff Faux Walking Stick Cosplay Costume Accessory or Halloween Haunted House Prop Decoration. Safe plastic toy staff with screaming hooded souls top. A Nightmarish Costume Accessory for a spooky Evil Wizard, Witch, Warlock, Grim Reaper or Angel of Death! 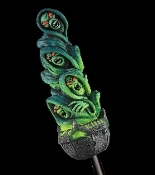 Harness the energy of innocence trapped in limbo with this creepy Screaming Souls Staff Prop, a plastic staff with tortured hooded figure decoration on top. Staff length 48-inches 120cm). 2 pieces. Also makes an eerie World of Warcraft inspired cosplay costume accessory!